We’d love your help. 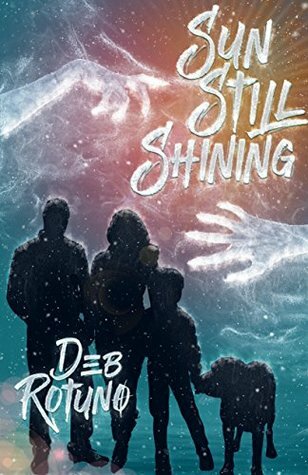 Let us know what’s wrong with this preview of Sun Still Shining by Deb Rotuno. As the Chambers family adjusts to being reunited with each other and their fellow camp members, winter starts to barrel down on the cabins at Clear Lake. The worry of impending snow and unknown violent survivors rests heavily on Jack’s shoulders. He’s determined to keep his family and friends safe, but time is ticking and space is running out at the cabins. Hope is a fragi As the Chambers family adjusts to being reunited with each other and their fellow camp members, winter starts to barrel down on the cabins at Clear Lake. The worry of impending snow and unknown violent survivors rests heavily on Jack’s shoulders. He’s determined to keep his family and friends safe, but time is ticking and space is running out at the cabins. Hope is a fragile thing in the new world, but that’s all Jack and Sara have to cling to as they face an uncertain future for themselves and their family. For no longer is the threat against them merely those infected by the virus unleashed by Hurricane Beatrice. While some stay at Clear Lake to protect the only home they have, others must scout out a new place to live that will accommodate them all. Someplace safe, someplace warm. But splitting up may prove dangerous. To ask other readers questions about Sun Still Shining, please sign up. Just finished this book. Really loved it. I have been following you since Twilight fanfiction and love your stuff. Is this the end of this series? This sequel filled with action, sad moments and happy moments. I will mark this as one of the series I will read over and over. Loved where the group went, their additions and losses and seeing the world shift back to a new normal. Thank you! I really enjoyed reading this book. I have re-read it a few times and it never disappoints. The journey that the group but especially the family takes is something that anyone could relate to when they are experiencing tough times in their life. The takes on zombies and there reaction to the weather was something that I was not expecting. Would definitely recommend this series to anyone. Deb has been married to her husband for going on 14 years. They've always had rescued pets, and at the moment, they have 4 cats. She was born and raised in central Florida. She loves the warm temperatures. She's worked in retail for almost 17 years, but if she were able to do anything she wanted, she would be a full-time reader, writer, and fur-baby mom. She has always been a big reader, and writing Deb has been married to her husband for going on 14 years. They've always had rescued pets, and at the moment, they have 4 cats.